The par 71 Legends Heathland Course designed by Tom Doak is a return to the grand “Old Country” traditions of the game. It has been distinctly molded in the image of the British Isles links courses with holes reminiscent of famous links. These include world-renown St. Andrews, as well as lesser known gems like Lahinch and Cruden Bay. 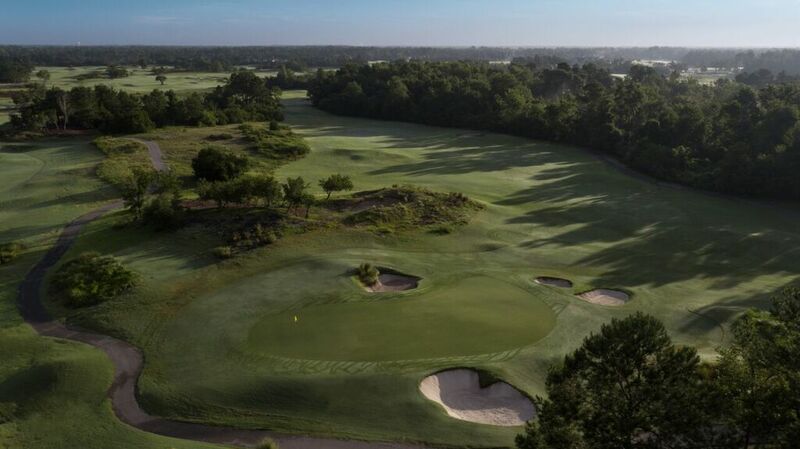 Most of the holes lack high vegetation providing a visual presentation like no other golf course in the Myrtle Beach area. The challenge and difficulty of the Legends Heathland course comes primarily from the unobstructed breeze that wafts constantly over. In addition the strategically placed bunkers and lush, deep rough that closely border all fairways also come into play. Many of the greenside bunkers are deep and require creative shots to make an escape. As part of the Legends Group, all rounds at the Heathland course include a free breakfast buffet, lunch from the menu, and two draft beers or fountain soft drinks. The Legends Group offers great rates on both stay and play packages, as well as tee time only packages. Their specialties include four and five courses packages, incorporating their five outstanding courses, and first-rate onsite accommodations at the Legends Resort complex.